624 pages | 37 B/W Illus. The Seventh Edition of this foundational text represents the most comprehensive source available for connecting multiple and diverse theories to literacy research, broadly defined, and features both cutting-edge and classic contributions from top scholars. Two decades into the 21st century, the Seventh Edition finds itself at a crossroads and differs from its predecessors in three major ways: the more encompassing term literacy replaces reading in the title to reflect sweeping changes in how readers and writers communicate in a digital era; the focus is on conceptual essays rather than a mix of essays and research reports in earlier volumes; and most notably, contemporary literacy models and processes enhance and extend earlier theories of reading and writing. Providing a tapestry of models and theories that have informed literacy research and instruction over the years, this volume’s strong historical grounding serves as a springboard from which new perspectives are presented. The chapters in this volume have been selected to inspire the interrogation of literacy theory and to foster its further evolution. This edition is a landmark volume in which dynamic, dialogic, and generative relations of power speak directly to the present generation of literacy theorists and researchers without losing the historical contexts that preceded them. Some additional archival essays from previous editions are available on the book’s eResource. Features chapters on emerging and contemporary theories that connect directly to issues of power and contrasts new models against more established counterparts. New chapters reflect sweeping changes in how readers and writers communicate in a digital era. Slimmer volume is complemented by some chapters from previous editions available online. 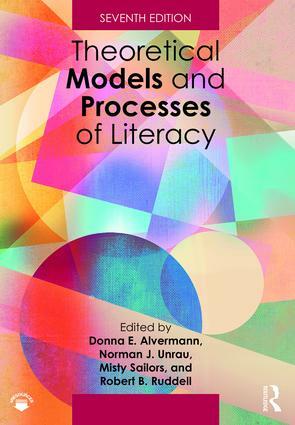 "Now in its 7th Edition, The Handbook of Theoretical Models and Processes of Literacy (TMPL7) has been the major force for keeping the field focused on the theories and models that underlie and shape our research enterprise as well as our everyday literacy praxis in and out of school. The Handbook has always been the go-to guide for keeping us honest and informed. It has always coaxed us to look backward to our history, outward to our current practice, and forward to new edges and new tools. This new 7th Edition is no exception to that rule--except that while earlier editions may have been more persuasive in encouraging looking backward or outward, number 7 coaxes us to look forward. TMPL7 is a must-have for every student of literacy research and practice." "This latest edition by the four powerful editors is by far a most satisfying intellectual feast on theoretical frames and processes of literacy learning and teaching. With a careful selection of classic theories as well as emerging new frames related to digital advancements, linguistic diversity, and social justice issues, this timely collection provides a transdisciplinary view of the state of the art in the field. It is a must-have guide for graduate students, new scholars, and seasoned researchers in all strands of literacy research." "The Seventh Edition of this landmark text masterfully preserves the important historical theoretical thinking in literacy while also bringing to the fore exciting new ways to conceptualize literacy theoretically. The latest edition is a must-read for everyone in literacy and related fields." "The Seventh Edition of this seminal text provides a wealth of crucial knowledge surrounding literacy theory and concepts. Newly written conceptual chapters on diverse topics provide cutting-edge frameworks upon which to build and connect literacy scholarship and research. The volume has a refreshing focus on a wide variety of theoretical issues of literacy and power, digital literacies, and more, all of which will be of substantial interest to literacy and education scholars." "Engaging new chapters remind us of how dynamic and broad the field of literacy currently is. Without a doubt, this text should be read by literacy educators and students alike, to foster dialogues about how the field was formed and how it continues to transform our understanding of what it means to be literate." 11. A Sociocognitive Model of Meaning-Construction: The Reader, the Teacher, the Text, and the Classroom Context. Donald A. Leu, et al. 18. A Relational Model of Adolescent Literacy Instruction: Disrupting the Discourse of "Every Teacher a Teacher of Reading"
Donna E. Alvermann is the University of Georgia Appointed Distinguished Research Professor of Language and Literacy Education, and holds the Omer Clyde and Elizabeth Parr Aderhold Professorship in Education at the University of Georgia, USA. Norman J. Unrau is Professor of Education Emeritus at California State University, Los Angeles, USA. Misty Sailors is Professor of Literacy Education and Director of the Center for the Inquiry of Transformative Literacies at the University of Texas at San Antonio, USA. Robert B. Ruddell is Professor Emeritus at the University of California at Berkeley, USA. With the publication of the Theoretical Models and Processes of Literacy, 7th Edition, edited by Donna Alvermann, Norm Unrau, Misty Sailors, and Robert Ruddell, Routledge has made available this repository of content previously published in Theoretical Models and Processes of Reading, 6th Edition (TMPR6). These chapters represent work that is both historical and important. With this resource, the corpus of the TMPR6 is readily available to individuals interested in all aspects of literacy that are informed by theory, including literacy instruction and literacy research.